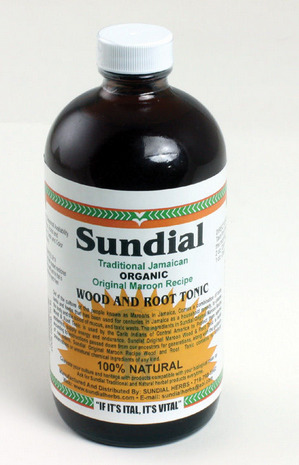 Out of the culture of the Maroons comes a formula combination that has been passed down for generations and nis now presented as SUNDIAL original Maroon recipe “Wood Root Tonic”, used traditionally in Jamaica as a household remedy and general tonic for the blood, body and nerves. The ingredients in this product has been used by the Carib Indians to protect them from epidemics and as a general tonic for the reproductive organs of both male and female. So if you are feeling run-down, tired, lacking energy, vim, vigor and vitality, try SUNDIAL traditional original Maroon recipe “Herbal Wood Root Tonic made the traditional way. Contains no artificial or chemical ingredients of any kind. 100% Natural. Remember, don’t just ask for Woodroot, ask for SUNDIAL every time. Made with wild organic herbs, roots and barks of the Caribbean, Latin America and Africa, using distilled and purified water. This product is made the traditional way, following the teachings of our elders and ancestors; and the guidance of the Most High. Ingredients: Purified, Filtered & Distilled Water, Chaney Root, Sarsaparilla Root, Black Wis, Milk Wiss, African Cayenne, Sour Sop Leaf, Mango Leaf, Cloves, Pimento & Cinnamon.